What, again riesling….?! Yes, because at the moment think it is THE best white wine grape. The Austrian winery Leindl is a young company from Zöbing in Kamptal. The main focus is on grapes Grüner Veltliner and Riesling, Muscat, Burgundy and Zweigelt and Merlot, Cabernet Sauvignon and St. Laurent. Tasted wine, Leindl Irrbling Riesling Reserve 2013, has been maturated 9 months in stainless steel tanks, and on top of that 3 months in bottles. Most of riesling wines get some flavor from oak barrels, which usually improves the taste. I have tasted really “hard” steel tank rieslings like Gun Metal, which was not so pleasant experience. However, Leindl’s Irrbling, at least the reserve one, exceeded expectations. Pale yellow with some light green apple, no visible acidity. Dry, some minerals but not so much as usually in Austian rieslings. No metal flavor, not too much petrol or acidity. Some might thing, that this is too light for riesling, but I do not. This wine is suitable with white fishes and white meats but also good choice for aperitif. Tasted the wine first as aperitif and then with spicy salad thai style and grilled giant shrimps. For main course had blue halibut with noodles again asian style. 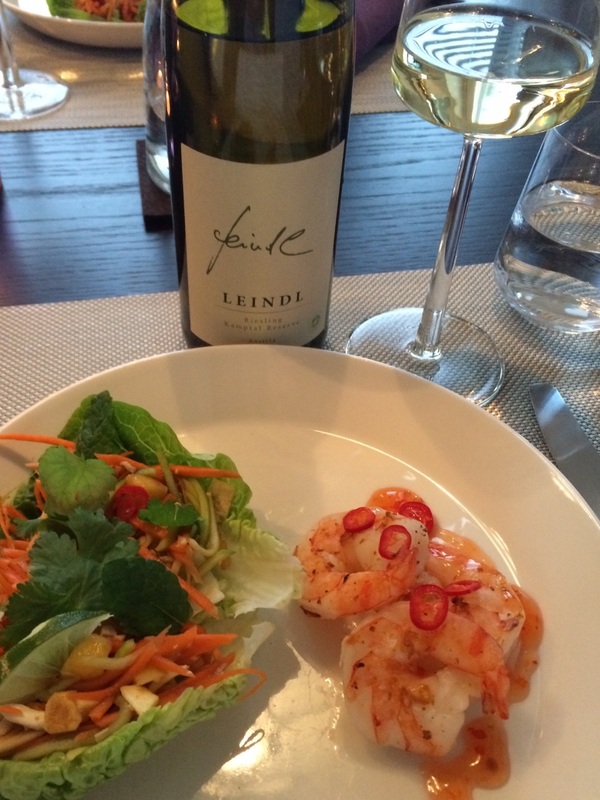 Leindl Irrbling Riesling Reserve 2013 paired nicely with both dishes. Bang for the buck is two plus because wine costs a little bit over 20€ in Alko. Cut few euros and this wine would be bull’s eye. Weingut Leindl | Wir verbinden Tradition & Innovation. It was! Thanks for reading the post. They are the best! Thanks for reading the post. I wish I could talk about wines the way you do. I just go… mmmm…. good… Or mmmm…. no good. My palate does the critique much better than I can with words. The food looks yummy, too. Warmest, SB. Try to find something from Aroma and Taste, that is all what is needed. Why wine is good or bad? Thanks for comment! Have a nice Sunday! Thank you so much. I’ll remember that for my next wine party. Warm wishes, SB.